Mummy finishes knitting Cat and wraps him up a surprise gift for Daisy. But Cat is confused, why was he made? He decides to try and find out wriggling free of the wrapping paper, leaving the house and setting out on an adventure, asking the darkness, the stars and the trees why he was made. They all have their own sense of purpose; the snow was made for dancing and the stars to shine. None of this helps Cat until Sun tells him he was made to give himself. Suddenly Cat realises why he was wrapped up with a ribbon. However, throughout his adventure Cat has been unravelling, will he be able to get back to his house? Fortunately he is rescued, Mummy gathers up the wool and remakes Cat who discovers the pleasure of being made especially for Daisy. 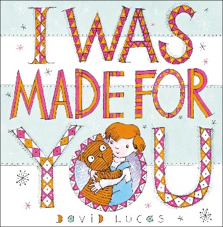 A story about seeking a sense of purpose, love and how special a homemade gift can be. When you read the story aloud to your child try changing your voice – whispering for the darkness and sounding deep and strong for rock. Your child could retell the story in their own words using the pictures to help them. If you can knit, or know someone who can, your child could watch how the knitting grows and what happens if the wool is unravelled. Make a collection of toys made from different materials, are any of them made from wool? Talk about the difference between them and how they feel. Make a picture, a card or a model for someone in the family. Use wool or string tie one end around a table leg and make a trail around the furniture for your child to follow. Perhaps a favourite toy could be at the other end of the trail to discover.